Personally, I LOVE Snickers Bars. But there are times when I really don't want (or need) a full sized Snickers Bars. These Mars Bites are just the thing for moments when you need a little chocolate treat. With football season in full swing, these would be perfect for setting out as a game day dessert and the fact that they are not individually wrapped makes them ideal for eating on the go or snacking on during a tailgate. 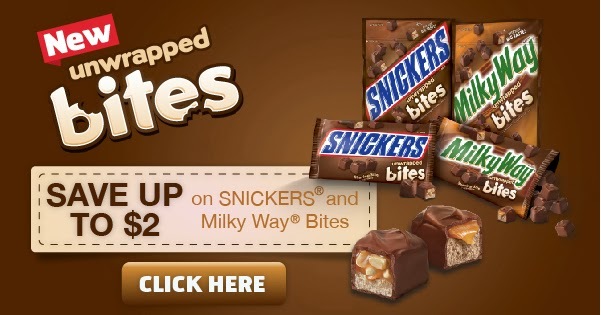 Want to grab some Snickers or Milky Way Bites for your self? Make sure to check out and print these coupons to help you save! The value of these coupons start at .25 cents and $1 but double if you share them with family and friends. So don't forget to print them before they run out and be sure to share them for even more savings!